Posted May 28, 2013 by laurielmorrison & filed under Book Reviews, Middle Grade Literature, Teaching, The Writing Process, Writing with an eye toward the market and your intended audience. 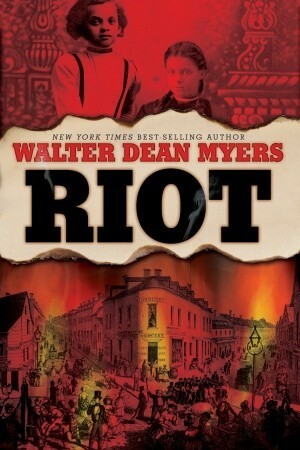 My seventh grade students recently finished reading Riot by Walter Dean Myers, which is set in New York City during the draft riots of 1863. Because the students had studied immigration and visited the Tenement Museum and New York Historical Society during a trip to New York, they were familiar with the setting of Riot, understood the tensions between Irish immigrants and black people, and even recognized some of the photographs in the appendix at the end of the book as things we had seen during our trip. My students and I appreciated the way Myers brings a historical situation to life in a compelling way by focusing on a (fictional) family who find themselves in an especially difficult situation: the Johnsons are a biracial family—half-black, half-Irish—so when poor Irish people, who can’t afford to pay $300 to get out of being drafted, begin to riot because of their fear that black people will take their jobs if the North wins the war, the Johnsons’ light-skinned teenage daughter, Claire, feels that the two sides of her identity cannot possibly fit together and no longer understands who she is. It wasn’t a bad thing that they reacted this way to Claire. We were able to talk about why the circumstances would have shaken Claire so deeply, and we noted that people don’t always react rationally when they are upset. But I was struck by how definite and unified they were in their response, especially since I’ve been noticing similar responses in reviews of various young adult books on Goodreads and Amazon. Recently, I’ve read a bunch of reviews of different books in which the reviewer comments on being “annoyed” or “bothered” by a character when that character makes mistakes or shows questionable judgment. I get a bit discouraged by these reviews. I am the kind of reader who cringes when a character makes a bad decision, so, as a writer, I have to force myself to let my characters mess up and then learn from their mistakes. But sometimes it seems like writers are stuck in a no-win situation. There isn’t enough tension or action if characters don’t make mistakes, but then readers get annoyed with them when they do! I asked my students if there were any main characters from books we’d read together who hadn’t annoyed them, and they gave me three: none of them had been annoyed by Matt Pin in Ann E. Burg’s All the Broken Pieces, Doug Swieteck in Gary D. Schmidt’s Okay for Now, or Curzon in Laurie Halse Anderson’s Forge. I started thinking about what these three likable, un-annoying narrator-protagonists had in common. They all certainly make mistakes. But they don’t engage in much introspection, and they are active characters with clear desires. 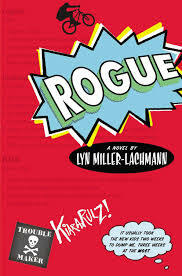 Meanwhile, the same day I talked about character likability with my seventh grade students, I finished reading my friend and VCFA classmate Lyn Miller-Lachmann’s wonderful middle grade novel, Rogue. Rogue tells the story of Kiara, a girl with undiagnosed Asperger’s syndrome, an obsession with the X-Men, and a desperate desire for a friend. Lyn wrote an insightful guest post on fellow VCFA alum Melanie Fishbane’s blog about the challenge of making Kiara a likable narrator. Lyn does a great job of developing secondary characters whose affection for Kiara builds Kiara’s likability. In addition to the two characters Lyn mentions in her blog post, a six-year-old neighbor and an elderly woman, there is also a charismatic older teen whose acceptance of Kiara encourages readers to accept her. In addition, Lyn also uses secondary characters who are unkind to Kiara to make readers relate to and feel protective of her. Lyn makes especially effective use of a flashback during which Kiara heard one of her brothers speculate on what’s wrong with her and what might have caused her “mutations.” This scene elicits great sympathy for Kiara, and readers can relate to the experience of hearing someone close to them say something hurtful (especially middle school readers, many of whom often worry about what others are saying about them). Also, as Lyn notes, Kiara’s strong desire, to find a friend and to discover her own “special power,” plays a major role in making her likable. Kiara ends up discovering a talent for making videos, and her video talent reveals a confident, competent part of her character. Furthermore, her desire for friends is so poignant and so consistent that readers will understand her motivation when she makes a few misguided decisions rather than feeling annoyed. I think these two strategies worked beautifully in Rogue. Lyn made me love Kiara, worry about her, and admire her, all at once. (Plus, I already passed the book on to a 7th grader, who has recommended it to others and didn’t have any “annoying character” complaints.) I learned a lot from Lyn’s novel and blog post, as well as from my students’ reactions to characters that have annoyed them. As I finish up revisions on my current novel-in-progress and then return to another writing project, which features a rather prickly and occasionally bratty narrator, I’ll keep these lessons from Lyn and my students in mind. Wow, Laurie. Great post. This really resonates with me: “They all certainly make mistakes. But they don’t engage in much introspection, and they are active characters with clear desires.” This is soooo hard to do. But I really appreciate the discussion you had with your students, to get to the bottom of what they appreciate about characters. And you’re so right about Lyn. She does this brilliantly in Rogue. You can’t help rooting for Kiara even when she makes mistakes!!!! While working on my WiP, I pondered how to allow my MC to make mistakes effectively. I didn’t want her to be a well-liked character within her world. I admit I pushed the whine button occasionally, which annoyed even me! I allowed her a little bit of whining, but I tried to have another character to around to chide her whenever she whined. Interesting post! I also agree with the part about active characters; they should be proactive, not reactive. Meaning of course, that everything that happens is not just a reaction to the latest conflict. I think there is a danger in the advice to “Chase your character up a tree, then throw rocks at them.” It seems to imply that random things are happening to the character and they just have to deal. But if the character herself decided to climb up the tree for a good reason, to accomplish some goal, you feel like she’s smart and goal-oriented, even if climbing up the tree ended up causing her more trouble. Thank you for the review, Laurie! And I’m honored that your student liked the novel so much and is passing it on. I talk about how Kiara is an autobiographical character, but in fact, she whines a lot less than I do. I need to learn from her example, and I think a lot of why she doesn’t whine is that she really believes she has a special power that she hasn’t found yet–and she’s going to keep looking until she does. Laurie – a great post is one that gets me thinking and this one does, so thank you! As Maya noted above, the observation about the character being active and having a clear desire is an important one. I’m intrigued, though, by the lack of introspection on the part of those characters who were not annoying. We want our characters to be emotionally authentic without being self-pitying and that can be difficult! I appreciate the way that you described how Lyn achieved likability for her main character, Kiara. I can’t wait to read ROGUE! Kiara does her introspection through the X-Men superheroes with whom she is obsessed. They help her to figure out a world that she doesn’t understand, and she can project her feelings of rejection onto Rogue, whose mother abandoned her and who had no friends except the evil mutant Mystique. And the fact that Rogue finds her place among Professor X and the other superhero mutants who fight to save the world gives Kiara hope that she, too, will find her place and it will be a good place.